Tracy Perryman is production manager for his family's small oil company in Luling, Texas. B.J.P. Inc. owns 116 wells that, combined, produce about 100 barrels a day. Perryman's family has been in the oil business in Luling since the 1920s, when a wildcatter drilled down a half-mile through ancient limestone and struck a small but productive field measuring 2-by-12 miles. 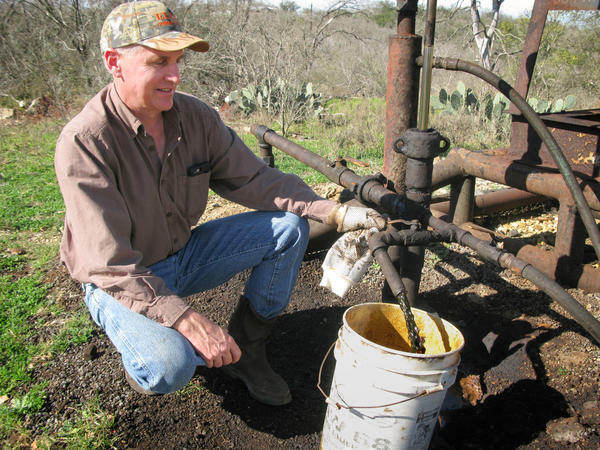 Nearly a century later, the Luling field, located about an hour south of Austin, is still active — there are about 9,000 producing wells in Caldwell County. They have made a good living for Perryman, production manager of B.J.P. Inc. Unlike the stereotype of the flamboyant, boorish Texas oilman, Perryman wears work clothes and speaks softly. Digging into a slice of smoky brisket in the dining room of Luling City Market, he looks out the window and considers what the price drop has meant for traffic rumbling through his hometown. "Gravel trucks, oil field trucks, oil haulers, rigs ... going right through Luling — it's maybe half as much or less in activity than it was when oil was $100 a barrel," he says. As it happens, the Luling field lies just north of the monster-sized Eagle Ford Shale formation, which has become one of the world's most prolific fields thanks to fracking and horizontal drilling. The old Luling wells are what are called stripper wells — they produce less than 15 barrels a day. After lunch, Perryman sits on the tailgate of his pickup next to one of his bobbing pumpjacks. The dirt is stained black and the air smells of rotten eggs. "This well that we're currently sitting by produces about a barrel-and-a-half of oil a day and about 20 barrels of saltwater," he says. "It was drilled in the early '60s. We anticipate that it will continue to produce for many, many years." So how does a small oilman stay above water when prices drop in half? "When oil is up, we know it's going to go down," Perryman says. "We try to spend the money on our equipment and our production to get it in good shape, so when it does go down, we have no debt, we have good equipment and we can ride through the hard times and get ready for the next boom." In better times, his company bought new pumpjacks, pipes, tanks, vehicles, forklifts and machine tools. They fixed roads and fences. And they paid cash. Today, everything has changed. They'll defer downhole maintenance on wells, they'll ignore potholes in their roads rather than call the gravel truck, and they'll try to repair broken equipment instead of replace it. "I don't believe that hard times are here yet," Perryman says. "In April of '98, we'd seen oil go down to $9 a barrel. And that was tough, because it was costing us $18, $19 a barrel ... just to get it out of the ground." Most small independents like Perryman cannot afford to explore for oil. They buy up properties from the majors, who decide to sell off marginal wells when they become less profitable. The Perryman family purchased its wells years ago from Humble Oil, which became Exxon. "Smaller, independent oil and gas producers like Tracy Perryman are of critical importance, obviously, to our state and our national economy," says Ed Longanecker, president of the Texas Independent Producers and Royalty Owners Association. He says in Texas — the nation's biggest crude oil producer — 41 percent of all wells are stripper wells like the ones in Luling. "The reason smaller independents can survive is because they are not drilling $5-, $10-, $15-million horizontal wells in the sweet spots ... of some of these shale formations." Perryman's company owns 116 wells — all of them shallow and vertical. Together, they produce about 100 barrels a day. Last summer when prices were high, they paid $10,000 a day. Today, it's half that. But year after year, the moaning pumpjacks keep Perryman's company afloat. The one he's sitting next to brings up 1 to 2 quarts of oil and saltwater with every stroke. "You get enough of these wells," Perryman says, grinning, "you can make a living, even at $45 a barrel, in Luling." Hard times have hit the oil field. A barrel of crude has dropped from a high of over $100 to less than $50 today. Houston Business Journal calls it the Oilpocalypse. Energy companies are expecting a 23 percent drop in quarterly profits. Oil services giant Schlumberger will cut 9,000 jobs. Occidental Petroleum and ConocoPhillips are slashing their budgets by a third. It's a familiar cycle and one that oilmen learn how to survive. John Burnett profiles an independent producer in Texas who has seen it all before. TRACY PERRYMAN: Two slices of brisket and a ring of sausage. BURNETT: ...And oil. Tracy Perryman's family has been in the oil business in Luling since the 1920s, when a wildcatter drilled down a half-mile through ancient limestone and struck oil. Nearly a century later the field is still active. PERRYMAN: In Caldwell County there's still almost 9,000 producing wells. BURNETT: Tracy Perryman, production manager of his family's small oil company, B.J.P. Inc., digs into his brisket in the dining room of the venerable Luling City Market. Unlike the stereotype of the flamboyant and boorish Texas oilman, he wears work clothes and speaks softly. He looks out the window and considers what the price drop has meant for traffic rumbling through his home town, located about an hour south of Austin. PERRYMAN: Gravel trucks, oil field trucks, oil haulers, rigs - all that kind of thing. You can just see, going right through Luling, it's maybe half as much or less in activity that it was when oil was a $100 a barrel. BURNETT: As it happens, the Luling field lies just north of the monster Eagle Ford shale formation. Fracking and horizontal drilling have made it one of the world's most prolific oil fields. The old Luling wells are what are called stripper wells. They produce less than 15 barrels a day. Perryman sits on the tailgate of his pickup next to a hillside of mesquite and post oak. The dirt is stained black and the air smells of rotten eggs. PERRYMAN: This well that we're currently sitting by produces about a barrel and a half of oil a day and about 20 barrels of salt water. It was drilled in the early '60s. We anticipate that it will continue to produce for many, many years. BURNETT: So what happens to a small oilman like you when prices drop in half? PERRYMAN: When oil is up, we know it's going to go down. We try to spend the money on our equipment and our production to get it in good shape. So when it does go down we have no debt, we have good equipment and we can ride through the hard times and get ready for the next boom. BURNETT: In better times, his company bought new pump jacks, pipes, tanks, vehicles, forklifts and machine tools. They fixed roads and fences and they paid cash. Today everything has changed. They'll defer down-hole maintenance on wells. They'll ignore potholes in their roads rather than call the gravel truck. And they'll try to repair broken equipment instead of replace it. They've been here before. PERRYMAN: I don't believe that hard times are here yet. In April of '98, we'd seen oil go down to $9 a barrel. That was tough because it was costing us $18, $19 a barrel, the expense of it just to get it out of the ground. BURNETT: Most small independents like Perryman cannot afford to explore for oil. They buy up properties from the majors, who decide to sell off marginal wells when they become less profitable. The Perryman family purchased its wells years ago from Humble Oil, which became Exxon. ED LONGANECKER: Smaller independent oil and gas producers like Tracy Perryman are of critical importance obviously to our state and our national economy. BURNETT: Ed Longanecker is president of the Texas Independent Producers and Royalty Owners Association. He says in Texas, the nation's biggest crude oil producer, 41 percent of all wells in the state are stripper wells like the ones in Luling. LONGANECKER: The reason smaller independents can survive is because they are not drilling $5, $10, $15 million horizontal wells in the sweet spots, you know, from an acreage standpoint, in some of these shale formations. BURNETT: Perryman's company owns 116 wells, all of them shallow and vertical. Together they produce about 100 barrels a day. Last summer when prices were high, they paid $10,000 a day. Today it's half that. But year after year, the moaning pumpjacks keep bobbing up and down. So with every stroke of this pumpjack, it's pulling a couple of quarts of oil out of the ground? PERRYMAN: Oil and saltwater. You get enough of these wells, you can make a living - even at $45 a barrel - in Luling. BURNETT: John Burnett, NPR News, Austin. Transcript provided by NPR, Copyright NPR.